Denman Pony Club was established in 1954 and we currently have a membership of 40. We are very fortunate to have such a wonderful ground and also to have the only One Day Event Course in Zone 7. 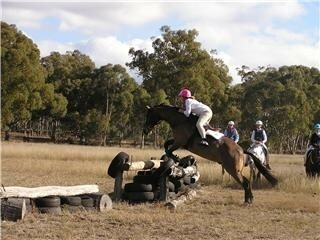 Denman Pony Club is in Zone 7 which contains the area from Murrurundi to Branxton and Moonan Flat to Cassilis. Each club holds a rally day on the second Sunday of each month at their own grounds. During the year each club holds a President's Cup Day and some a Ribbon Day. These days are open to all Pony Club members even out of our Zone. On these day they usually have riding and hacking class in the morning and sporting events and jumping in the afternoon, but each club may vary their program as they wish. The cost of these days are approximately $12 to $15. Pony club rules are one horse one rider other then led which may use the same horse. You may be a led rider until the age of 7 years. When attending a competition day you must wear your club uniform and club saddlecloth and have the correct pony club equipment. Pony club T-shirts may be worn for sporting from October school holidays to April holidays (not winter months) and not at the Jamboree.